Eastern Slovakia, once the historic crossroads of Gothic and commercial trade routes, lies only 200 kilometres from the geographical centre of Europe, located at Kremnické Bane, in Slovakia. The region covers approximately one-third of the area of Slovakia, and the fact that its highest and lowest geographical points are separated by nearly 2,600 metres of elevation is testimony to the natural divisions and diversity of the landscape. Accept this invitation to the region, where today people live in the pulsating present and do so in harmony with the lovely nature that surrounds their homes. Geographically, Slovakia is one of the most conveniently situated countries. Located in the centre of Europe, Slovakia is predestined to excellence in terms of both tourism and business as it lies on a crossroads of European significance. 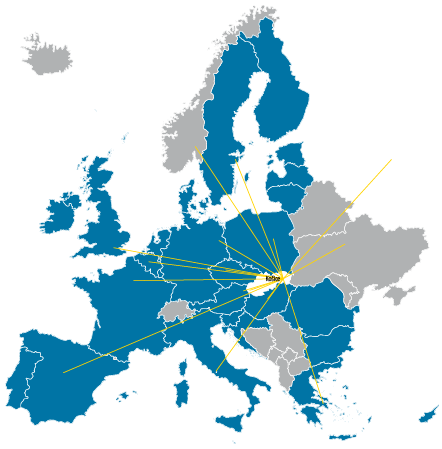 Thanks to Slovakia’s rich and growing infrastructure, the whole European Union is at its reach, let alone the Eastern European countries and Russia. Slovakia is at a stone’s throw not only from the capitals of the neighbouring countries – Budapest, Warsaw – but also from a number of cities and locations of historical and commercial importance – Miskolc, Uzhgorod, Kraków.